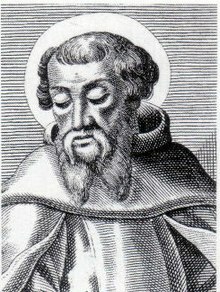 Irenaeus (early 2nd century – c. AD 202), also referred to as Saint Irenaeus, was Bishop of Lugdunum in Gaul, then a part of the Roman Empire (now Lyon, France). He was an early Church Father and apologist, and his writings were formative in the early development of Christian theology. Gloria enim Dei vivens homo, vita autem hominis visio Dei. For the glory of God is the living man, and the life of man is the vision of God. Book 4, Chapter 34, Section 7. Often mistranslated as "The glory of God is man fully alive" (see ). The context of the passage is: "And for this reason did the Word become the dispenser of the paternal grace for the benefit of men, for whom He made such great dispensations, revealing God indeed to men, but presenting man to God, and preserving at the same time the invisibility of the Father, lest man should at any time become a despiser of God, and that he should always possess something towards which he might advance; but, on the other hand, revealing God to men through many dispensations, lest man, falling away from God altogether, should cease to exist. For the glory of God is a living man; and the life of man consists in beholding God. For if the manifestation of God which is made by means of the creation, affords life to all living in the earth, much more does that revelation of the Father which comes through the Word, give life to those who see God." Esaias says: “The wolf also shall feed with the lamb, and the leopard shall take his rest with the kid; the calf also, and the bull, and the lion shall eat together; and a little boy shall lead them. …” I am quite aware that some persons endeavour to refer these words to the case of savage men, both of different nations and various habits, who come to believe, and when they have believed, act in harmony with the righteous. But although this is [true] now with regard to some men coming from various nations to the harmony of the faith, nevertheless in the resurrection of the just [the words shall also apply] to those animals mentioned. For God is rich in all things. And it is right that when the creation is restored, all the animals should … revert to the food originally given by God … that is, the productions of the earth. "The business of the Christian is nothing else than to be ever preparing for death"
Book II, ch. 22. Irenaeus' unconventional views about the age of Jesus and the length of his ministry. This page was last edited on 7 October 2018, at 15:50.